Life before COR Retreat was one of constant confusion and frustration. I knew I had a problem with food but simply could not figure out how to deal with it. My life from the outside looked really good; I had everything I thought I ever wanted but on the inside I was suffering. I didn’t really know how to care for myself. I did not believe that I could or should share my feelings with anyone. My eating was escalating and I hated myself for it. I was lonely, I was sad, I had given up on finding an answer and I was working on just trying to accept myself the way that I was. I weighed over 300 lbs, with physical pain from arthritis, having heart palpitations, waking up gasping for breath during the night and beginning to feel that I might die soon if something didn’t change. I found COR Retreat by watching a TV show that briefly featured a residential eating disorder treatment center. I wasn’t aware of such a thing! That led me to an internet search which lead me to COR Retreat. When I found COR Retreat I knew I had to go. I arrived at COR Retreat feeling scared about what it would be like, but also scared that this too would fail just as all of the previous diets, hypnosis, counseling, fasting, exercising, etc. had failed. Thankfully COR Retreat was different. I was with a group of people who were in exactly the same situation I was in. We learned that what was going on with us was a disease! Not that we were lazy or lacked willpower or were stupid; that we have a physical disease but also the mental disease of obsession. We learned that there was a way to manage this problem and heard so many powerful stories from people in recovery from Compulsive Overeating, Anorexia or Bulimia -- all the ways we’ve tried to use food to try to control our lives. We were able to put food in its proper place, using it simply as fuel for our bodies. We got abstinent together during our time at COR Retreat. We learned about recovery and were able to work on Steps 1, 2 and 3 as well as practice meditation, and a daily inventory. We were supported in finding a temporary sponsor before we left, encouraged to build a support system, and had a food plan in place to start us off on the right path. Once I returned home, I found a wonderful 12-step recovery group with real recovery going on. These people have become my mentors and friends, and have shown me that long-term recovery is possible. I began working the program and have discovered that I need to be patient with myself. I didn’t “get it” all right away and I still struggle with some of it. The main thing is that I continue to work the program as best I can and plan to stick with it because it DOES work! I see it clearly in others but have been able to see the promises come true even for ME! I never expected that. After two years I am free of 75 lbs and I am able to move and breathe with greater ease. Better yet, I am free of the self-hatred, confusion and frustration that came with trying for over 30 years to figure out why I couldn’t handle my eating. I am amazed and delighted to be free from the constant obsession around food. I feel safer in my body, safer to be by myself and safer out in the world. I have times (for the first time in my life) that I feel like perhaps I DO have something to contribute in a discussion, or in a situation, or in general. I feel more confident, and happier overall. According to my husband, I seem to be more able to enjoy being in the moment. I’m not worrying about where my next treat/snack/meal will come from, how I will hide it, where to put the evidence, and so on. The best thing is that I have real hope now. I have hope that I am finally moving closer to my goal of living with integrity that I set for myself a long time ago. I am grateful to be developing a real relationship with a Higher Power that is always available and always looking out for me. I am grateful to have better relationships with others and especially with myself. It’s not always easy, but I can choose to do this today and I have the support of new friends in my life who totally “get me” and a Higher Power who wants to connect with me and help me heal! Life is good! Thank you COR Retreat! COR Retreat is a residential retreat program that teaches a way to live free from the obsession with food through a 12 step program. 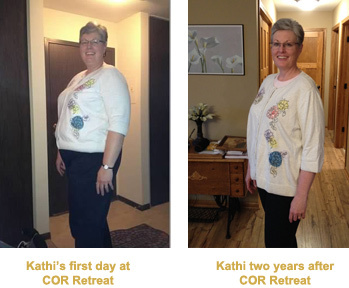 COR Retreats are 5-day programs, scheduled each month at the McIver Center in Wayzata, MN. Learn more about the COR Retreat Experience, and register online to attend an upcoming retreat.